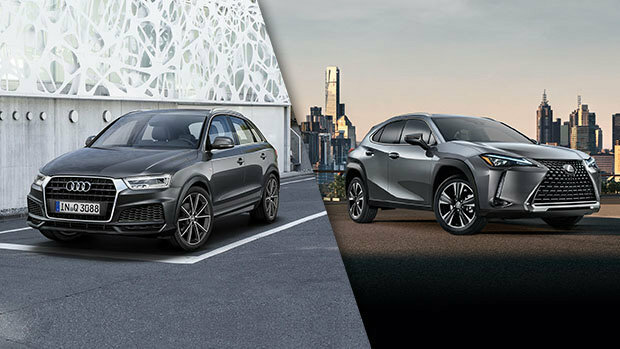 Compact SUVs are popular these days, and the 2018 Audi Q3 and 2019 Lexus UX that you can see and try at your Spinelli Lexus dealership are engaging in a friendly duel. Here we are in the segment of compact luxury SUVs. They are the favourite vehicles for the trendy city dwellers of the West Island and Downtown Montreal, Dorval and Laval. For this test, we have compared the 2018 Audi Q3 and the brand-new and beautiful 2019 Lexus UX, sold at your Lexus Spinelli dealership. This crossover, built on a new chassis, gives it a very low centre of gravity, and so it behaves like a hatchback. Available in 2 versions, the UX 200 FWD and the UX 250 H AWD, the latter, a self-charging hybrid includes the 4-wheel drive. Both offer F Sport option packages. The Lexus UX 200 SUV has a 169-horsepower 2.0-litre 4-cylinder engine. The Lexus + 2.0 security system with rear-view camera, Direct Shift continuously variable transmission, Lexus Enform Audio compatible with Apple CarPlay, and heated and ventilated front seats, among others, come as standard. Thanks to Lexus's new global architecture (GA-C) platform, high structural stiffness, low centre of gravity and very tight turning radius, you will have a dynamic ultra-precise and lively driving experience, as well as optimum stability. Unsurprisingly, the 2019 UX's interior is remarkably appealing, as is its exterior by the way, and it is replaced by high-end technology and unparalleled comfort. It possesses an impressive array of safety features and driver-assistance systems which are also part of the equipment. The 2018 Q3, on the other hand, is offered in 3 variants, the Komfort, the Progressiv and the Technik, much more sober in style than the UX, which is more sporty and more incisive. Its engine, a 200 hp 4-cylinder turbo, joins the Tiptronic 6-speed transmission, and to get the 4-wheel drive quattro, you will have to turn to the Progressiv version, because the basic version does not offer it. Safety features and driving aids are plentifully available, many of them being optional. Finally, if style matters to you, the one of the 2019 Lexus UX is unquestionably much more striking and dynamic. Come and try it out at Spinelli Lexus in the West Island, near downtown Montreal, Dorval, and easily accessible from Autoroute 13 in Laval. Find out about our special offers and Lexus financing service. See you soon!